← Is it really investigative reporting’s golden age? 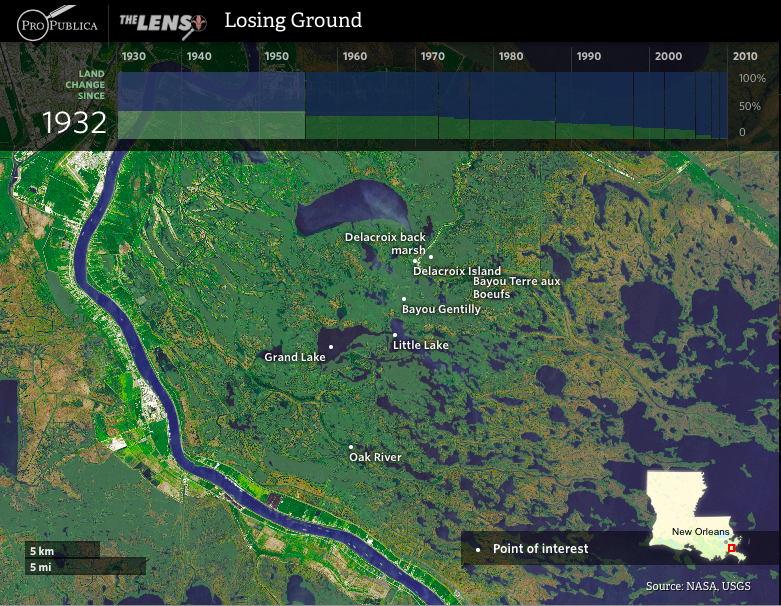 On the same day, August 28, the ninth anniversary of Hurricane Katrina, Pro Publica and the New Orleans nonprofit news site The Lens unveiled “Losing Ground,” an interactive map using satellite imagery that showed how nearly 2,000 square miles of coastal land in southeastern Louisiana had disappeared in the past 80 years as levees, canals and oil wells and pipelines were built. Given the current rate that the sea is rising and land sinking, the story said, most of southeastern Louisiana would be under water in 50 years. Using 40 years worth of images from NASA’s Landsat satellites, the report dramatized the scale and severity of the problem. 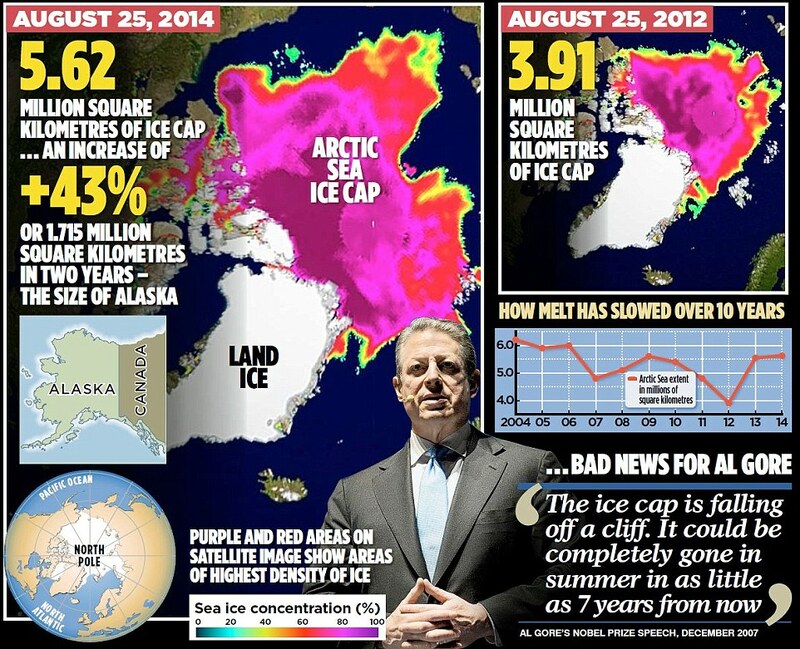 Two Pro Publica developer-journalists worked six months to process the Landsat sensing data and used maps and aerial photography from the US Geological Survey dating back to the 1920s. The resulting news app visualized how much the land had changed in 80 years. The opening scene of the app has eight layers. The top one uses scanned copy of a 1922 survey map owned by the USGS and scanned by the Louisiana State University library. Jacobs pulled it into his mapping software to match the geographic features with GIS location data and used photoshop to prepare it for online display; cutting out the water and normalizing the color. The bottom layer displays the 2014 coastline – stitched together from six Landsat 8 tiles, including many steps of processing. Jacobs picked out images from satellite passes when the skies were free from cloud cover. After pulling in the image tiles from the infrared and true-color bands and merging them together, Jacobs normalized the distortions and color differences so the separate images would mosaic consistently. Stories like this make it seem that satellite images are the next frontier in a high-stakes propaganda war being fought in the media. 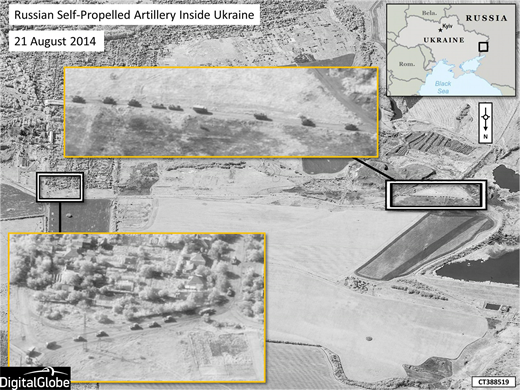 It’s true that there have been a few examples of innovative and sophisticated use of satellite imagery, but journalists have not always been helpful in providing context, in verifying the provenance and meaning of the images and in assessing their reliability. They’ve also been behind the curve in terms of constructing platforms that allow the audience to examine satellite images and data and to contribute to the existing body of knowledge. In this category, two examples stand out: Global Forest Watch, which uses satellite photos to track deforestation in real time and urges users to check them out and do something about them, and InfoAmazonia, where a group of nonprofits and journalists share maps, stories and data about nine countries making up the Amazon region. Global Forest Watch analyzes imagery from NASA satellites to find likely forest clearing activity every 16 days and sends out alerts that provide the latitude and longitude of the areas where the clearing was believed to have taken place. One can search by country – say Indonesia or Brazil – and see how the forest cover has changed since 2006 and check the most recent alerts about forest clearing. Similarly, Info Amazonia makes available maps and datasets. A recent project visualized two years of forest fires in the Amazon using NASA satellite data. One may not need a PhD to use the maps, but it can be a hard slog and the interfaces are not always intuitive. Still, NGO use of satellite mapping has come a long way in the past decade. In the beginning, they were mainly used to corroborate information that came from elsewhere. In 2007, for example, the American Association for the Advancement of Science used before-and-after satellite photos to show the destruction of Karen villages in Myanmar and verify reports of human rights violations there. In 2005, AAAS found satellite images that corroborated eyewitness accounts of the demolition of settlements in Zimbabwe, and in 2006, the destruction of villages in Darfur. In satellite imagery as elsewhere, our capacity to aggregate, analyze and interpret is outstripped by the quantity and speed of information being produced and made freely available. If anything, all these projects demonstrate the need for a new literacy in satellite imagery, not just for journalists or others in the information space but also for citizens who are likely going to be served more and more of these images as part of their daily diet of news. really excellent information designed for visitors.